City Hall (November 17, 2005) – Council Member David I. Weprin (D-Hollis) [pictured], Chair of the Council Finance Committee, hosted a press conference today with the Sikh Coalition and many other organizations. The press conference took place prior to the first hearing on Int. 577, the Uniformed Agency Anti-Discrimination bill. 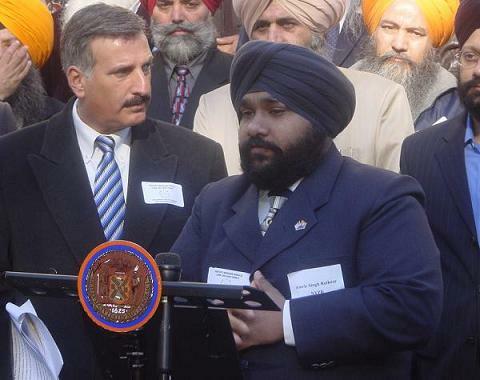 The bill, drafted by the Sikh Coalition , seeks to amend the administrative code of the city of New York, in relation to precluding all uniformed city agencies from mandating that their employees comply with a uniform code that would require such person to violate or forego a practice of his or her creed or religion. Employee uniform policies have been a source of debate in New York City government agencies. Two Sikh New York City Police Department (“NYPD”) officers were fired in 2001 by the NYPD because they refused to remove their religiously-mandated turbans. The New York City Transit Authority (“TA”) presently requires its Sikh and Muslim employees to brand their religious headdress with the Transit Authority’s corporate logo in order to maintain their current employment titles. The TA had initially demanded that its Sikh and Muslim employees remove their religious headdress entirely. In addition to the Sikh Coalition, the following is a sampling of organizations that support Int. 577 and attended the press conference: American Jewish Committee, New Immigrant Community Empowerment, New York Disaster Interfaith Services, Anti-Defamation League of New York, New York Immigration Coalition, Coney Island Avenue Project, South Asian Bar Association of New York, Lesbian, Gay, Bisexual & Transgender Community Center, Arab American Association, Association of Muslim American Lawyers, The Anti-Defamation League, Baba Makhan Shah Lubana Gurdwara, Sikh Cultural Society. 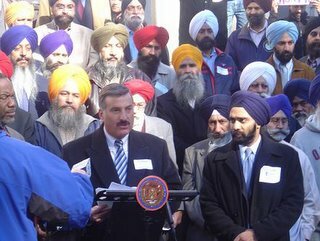 At the hearing following the press conference, the TA employees who were victims of religious discrimination, led Council Member David Weprin and the Sikh Coalition, testified that they worked for decades without being required to wear a TA logo on their religious headdress. A United States Department of Justice study during February 2005 found that TA workers regularly wear Yankees and Mets caps, fashion knit caps, and TA issued winter hats without a logo. “There are turban-wearing Sikhs fighting side by side with American troops in Afghanistan and Iraq as part of the army of Great Britain. If a Sikh can fight and die with American troops in Iraq, they should be able to police New York City’s streets,” said Amric Singh Rathour [pictured], a NYPD traffic enforcement agent who filed a federal lawsuit against the NYPD after being fired for refusing to remove his turban. “ I was delighted to win my lawsuit, but I hope no New Yorker has to go to court again to serve his or her city,” said Mr. Rathour.